Wednesday, 07. 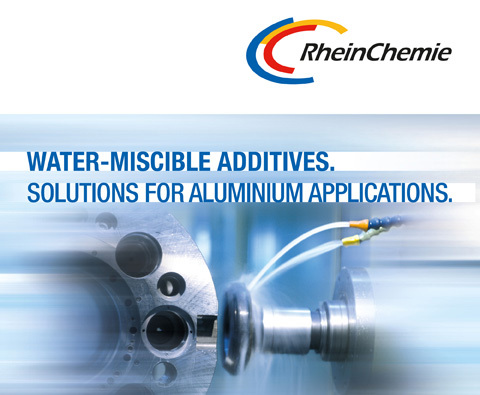 March 2012 As one of the leading solution provider for high-performance lubricant additives worldwide, Rhein Chemie has widened its portfolio by a product range of new water-miscible additives. To enhance the Additin® product portfolio Rhein Chemie now has expanded its broad product portfolio by a comprehensive range of single components, as well as additive packages for water-based applications. Mannheim, March 7, 2012 – As one of the leading solution provider for high-performance lubricant additives worldwide, Rhein Chemie has widened its portfolio by a product range of new water-miscible additives. To enhance the Additin® product portfolio Rhein Chemie now has expanded its broad product portfolio by a comprehensive range of single components, as well as additive packages for water-based applications. The Additin® water-miscible 5000 series is designed for water-soluble and emulsifiable metalworking fluids. The new products are very well coordinated with today’s needs of metalworking processes and they support Rhein Chemie’s leading market position as innovative manufacturer of additives for the lubricant industry. Additin® RC 5820 provides a new mechanism for aluminum corrosion inhibition without the use of phosphorus and silicon chemistries that are typically used in today’s metalworking fluids. The additive package Additin® RC 5610 offers a fundamental platform to enable metalworking fluid manufacturers to produce advanced aluminum machining fluids. Free from boron, amines, phosphorus and chlorine making this additive is ideal for the automotive and aerospace industries. These new products are designed to meet the needs for the modern day metalworking processes. Aluminum machining has become a cornerstone of the metalworking industry. In recent years the growth in the machining of aluminum has far surpassed the development in the chemistry used in such applications. The following products are only a highlight of the new product portfolio Rhein Chemie has to offer in replacing second generation technology. “In a region where oil-based metalworking fluids still account for majority of the market, unlike the developed west, this makes the Fuels and Lubes conference in Macao the obvious place to launch our new Additin RC 5000 series. Coinciding with the continual growth in the ASEAN region, Rhein Chemie has dedicated resource with ‘state of the art’ laboratory facilities making RCQ the global competency center for water-miscible metalworking fluids”, says Liam Johnson, Head of Application Lubricant Oil Additives Asia. Research and development will be focused on additives and additive packages for water based applications, complementing the existing product range, currently offered by Rhein Chemie. Under the brand name Additin®, Rhein Chemie markets a very broad range of specialty, high-performance additives and formulations: extreme-pressure additives, antiwear additives, corrosion inhibition additives, water-miscible additives, antioxidants and specialty products. Completing the portfolio are high-performance additive packages for metalworking fluids, as well as hydraulic, turbine, compressor, gear and multipurpose oils.